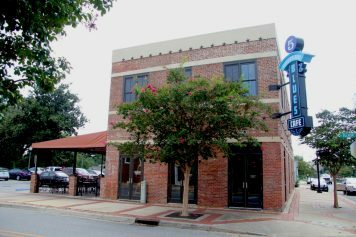 Five Sisters Blues Cafe, located at 421 West Belmont on the corner of Belmont and DeVilliers streets, is a restaurant built on some of Pensacola’s deepest history right in the heart of historic downtown Pensacola – The Blocks. For decades this intersection was the epicenter of African-American business and social life. It was here that the progression of musical culture made its mark in Pensacola Each of the four corners of the intersection feature buildings that date to the neighborhood’s historic period that served as the hub of the blues community; including Gussie’s Record Shop, WBOP Radio Station and Abe’s 506 Club. As talent passed through and the good times rolled, the neighborhood welcomed musicians Louis Armstrong, Aretha Franklin, Ike & Tina Turner, James Brown, Clarence Carter, Ray Charles, Fats Domino, Percy Sledge, Count Bassie, Wally Mercer Jr, Gwen McRae, Otis Redding, Don Shirley, James & Bobby Purify and many, many more. In 2010, community leaders and active residents worked together to revitalize this important historical neighborhood, recapturing the musical history of The Blocks. 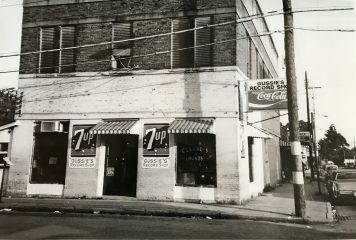 Five Sisters is located on the former site of Gussie’s Record Shop and WBOP Radio Station. In 2010 Cecil Johnson, a former chef at sister restaurant, the Fish House, wanted to open a place to honor the recipes of his mother Jeanette and her sisters; Cora, Sara, Dorothy and Margaret as well as the rich blues history of the neighborhood. 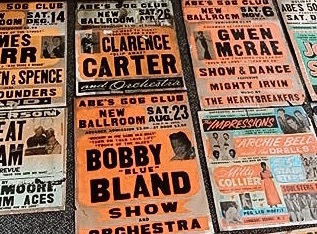 The menu features a number of the sisters’ original recipes while the restaurant’s décor focuses on the original performance posters from Abe’s 506 Club that were hung in Gussie’s Record Shop. 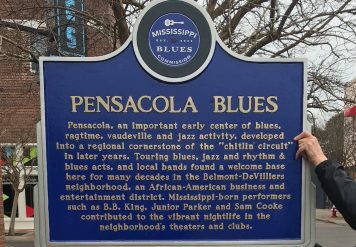 On January 18, 2018, the Belmont-DeVilliers neighborhood was honored with a Mississippi Blues Marker celebrating our rich Pensacola blues history. The marker is located right outside of our front door and can be found on the Mississippi Blues Trail. In 2003, the Mississippi Blues Commission was created to promote the understanding of blues history, primarily by installing Mississippi Blues Trail markers across the state to identify significant contributions to the Blues’ musical heritage. The marker recognizes Pensacola, as an important early center of blues, ragtime, vaudeville and jazz activity, which developed into a regional cornerstone of the “chitlin’ circuit” in later years. Touring blues, jazz and rhythm & blues acts and local bands found a welcome base here in the Belmont-DeVilliers African-American business and entertainment district for several decades. Mississippi-born performers such as B.B. King, Junior Parker and Sam Cooke contributed to the vibrant nightlife in the neighborhood’s theaters and clubs. The Belmont DeVilliers neighborhood served as a stopping point for touring musicians and a place where local musicians could develop. Additionally, The marker also recognizes the work of those in the neighborhood that help to foster the growth and appreciate of the blues through their commitment to the neighborhood including Gussie Streeter of Gussie’s Record Shop and Abe Pierce Sr, of Abe’s 506 and Savoy Ballroom. Our love of food and music is what created the vision for this restaurant, where both of these things come together for you and your family to enjoy! Five Sisters Blues Cafe is part of the Great Southern Restaurants family which is locally owned and operated in Pensacola, Florida. Sisters entities include The Fish House, Atlas Oyster House, The Deck Bar, Jackson’s Steakhouse, Great Southern Catering & Events, Palafox House and Angelena’s. 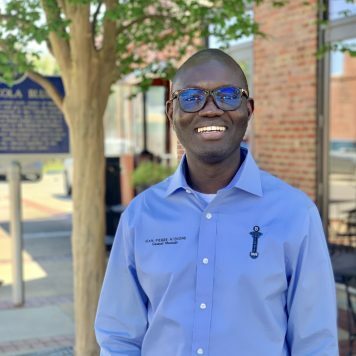 Born in Senegal, West Africa, and raised in Toulouse, France, Jean Pierre moved to New Hampshire in 1998 for 9 months to try something new but ending up cutting his stay short from the cold and relocating to sunny Pensacola, Florida. He began his employment at the Fish House as a server in 2001 and discovered his passion for the restaurant industry and only 11 months later was promoted to Service Manager; in 2009 he became the General Manager of the Fish House, Atlas Oyster House, and the Fish House Deck Bar. In January of 2010, Jean Pierre decided to make his residency official, he applied for and was granted U.S. citizenship; shortly thereafter he graduated from our own University of West Florida with a Bachelors degree in Accounting. When it comes to our restaurants Jean Pierre’s philosophy is to ensure all of our guests feel welcome and have the most memorable dining experience at Our House.